This looks sooooo good! I love anything chocolate!! I agree that this was insanely delicious. My daughter wants me to make another one tomorrow! I love your revamped title of the recipe! It looks (and we know it tastes) amazing! 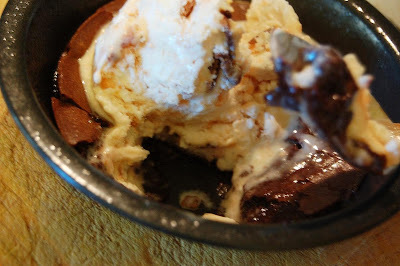 I watched the episode where she made this brownie pudding and it looked so amazing! Glad you enjoyed it :) Yours looks just as yummy as Ina's! It does look delicious. I think it is the perfect thing to have for breakfast. 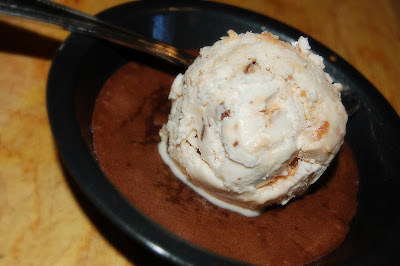 Oh and butterfinger ice cream........sheesh! Ooooh. That does look amazing. Did you know that eating chocolate while pregnant = mellow baby? It's scientifically proven! So keep it up! I have been DYING to make this, but was waiting for an occasion...I'm starting to think that just being Thursday is occasion enough. Oh...the recipe you posted, is that before cutting back on the butter or after? I would want to do that, too. Nom nom nom! I was on the fence about making this one, but now the eggs are on the counter. Yessssss. I have to say this looks rather tasty! I can see why you love it. I'm going to have to try this one! Wow, before reading your post I wasn't sure if I'd make this recipe- already have so many good chocolate cake/pudding recipes- but now I think I have to make it! Oh - that looks SO good! I don't think I would have any self-control if I made it! Ina has never done me wrong. Your pictures look amazing! I still need to get my post up, before it is all gone! Anne, I was going to write a love letter like that to YOU next week to thank you for picking that tomato goat cheese tart, and the cheesecake, and the apple turnovers. You have a knack for picking winners. So if you say that this is the best dessert you've ever had, well, suffice it to say that I will leave skid marks on my way to the grocery to buy the necessary ingredients to make these. Oh, I SO would be eating that for breakfast if that was in my kitchen! Looks fabulous! 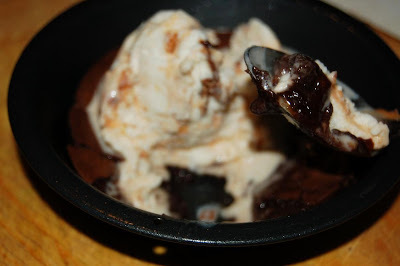 Man, after reading your letter to Ina and this recipe, I know I have to make this brownie pudding. It's not a question of "if," just a question of "when." It's 10 minutes til midnight, but I'm tempted to make it right now!! YUM! I made that several months ago - and it is freaking-awesome! Is there anything Ina makes I don't like? This is to die for! Anne, I could have written that letter. I think her and Jeffrey are just so cute together. And I think T.R. needs more air time (so cute!). This looks delicious! And congratulations on your new little one!!!! Words cannot describe how yummy this dessert was! I hope Ina makes it to Arizona so you can meet her. You inspire me as much as Ina. I can't wait to make this and share it with my family. I made this tonight and it didn't turn out!! I couldn't believe it, cause it looked done and I had it in the oven for 35 min! Well, I popped a single one in the microwave for a minute and it seemed to taste ok, probably not like it was supposed to but it was good. BTW I love all your other recipes I've tried!! I just subscribed to your blog (just realized I could do that, DUH!) Looking forward to future posts!! I was looking for something creative and new like this. Then tried this awesome recipe. This recipe does not disappoint. It's a snap to prepare and really tasty. Ina is my favorite. I saw this recipe on Barefoot Contessa and have planned to try it. I shall make it this next week for a family dinner.